The late Thomas Fleming was the author of more than 40 works of fiction and non-fiction. 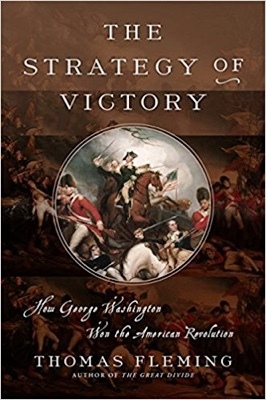 His last book, The Strategy of Victory: How General George Washington Won the American Revolution, was just published by Da Capo Press, from which this article is adapted. The year is 1783, the date, March 15—the legendary Ides of March—a day forever filled with foreboding since the assassination of a famous general who sought imperial power, Julius Caesar, more than 2,000 years ago. For the Americans of 1783 the foreboding was especially intense because Caesar’s murder led to the destruction of the Roman Republic and to centuries of rule by emperors. Was the fragile new American republic about to experience a similar fate? We are in the final year of the eight-year struggle that we call the American Revolution. Lieutenant General George Washington is in New Windsor, the American Continental Army’s winter camp near Newburgh on the Hudson River in New York. He is about to walk out onto a stage in a building called the Temple of Virtue and confront a galaxy of faces stained with sullen dislike and distrust of his leadership. These ominous visages belong to the officers of the Continental Army. Dangling in precarious balance is the future of the United States of America. Most twenty-first-century Americans, when and if they learn of this confrontation, can only stare in amazement and disbelief. George Washington, the father of our country, despised and disliked by the men who had spent most of the previous decade risking their lives in obedience to his orders? Why do we celebrate Washington’s birthday and consider his home, Mount Vernon, a shrine? Why have we named the capital of the world’s most powerful nation in his honor? And erected the world’s tallest stone monument to immortalize his name? We can sum it up with four words: The Strategy of Victory. This confrontation in New Windsor was part of the price Washington was paying for the drastic changes he had made in the way America fought the Revolutionary War. He did not foresee this discord; nor was he sure he and the nation would survive it. More important for today’s readers, the crisis forces us to think about the Revolution—and George Washington—in a new way. “Why do you say that?” I asked. “He lost more battles than he won.” At that time, I thought of Washington largely as a figurehead. “Yes,” they replied. “But he changed the strategy of the war. In the middle of the war. That’s the hardest thing for a general to do.” I soon grasped that strategy is the essence of a general’s job — an idea most civilians may find puzzling or at least surprising. The word derives from the ancient Greek word strategia, meaning “the art of troop leader, office of command.” It did not become part of Western vernacular languages until the eighteenth century. What does all this tell us about Washington’s strategy of victory? Perhaps most importantly, it underscores its profoundly human aspect. A winning strategy was not some dry, abstract theory for professors to teach in university classrooms. It could not fit neatly into a single sentence. Essentially it was a cluster of ideas and insights, all linked to a way of winning a specific war. For George Washington the war was the revolt of the thirteen American colonies against Great Britain, the most powerful nation in the world of 1776. To win was to open a glorious future for America. To lose was to vanish over one of history’s precipices, never to be seen and scarcely to be mentioned again. Small wonder that Washington’s strategy aroused violent hostility and even more violent affirmations by men who cared passionately about its outcome. George Washington was one of these caring men. As he would tell the officers he faced in the Temple of Virtue, he had been one of the first to step forward to defend “our common country.” Since that time he had “never left your [the army’s] side.” He was talking about the prime years of his life — from the ages of forty-three to fifty-one. He had devoted most of a decade to creating and maintaining the strategy of victory, sharing it with other soldiers who saw its essential importance, defending it against skeptics and critics, risking it again and again in the most nerve-shredding way imaginable—on battlefields where, veteran soldiers are often inclined to say, if anything can go wrong it will. This glimpse of the strategy of victory tells us enough about George Washington’s ordeal to grasp its central role in America’s history. Adapted from The Strategy of Victory: How General George Washington Won the American Revolution by Thomas Fleming. Copyright ©2017. Available from Da Capo Press, an imprint of Perseus Books, LLC, a subsidiary of Hachette Book Group, Inc.